I am here taking over the blog that Lucy used to write. She was my parent’s beloved friend. They miss her very much. I never knew her but know that I have some big paws to fill. I may never be her size in stature but know I am here to the rescue to fill their hearts will lots of puppy kisses and tail wags. I am totally up for the challenge. After all I have puppy personality + and I am my own loveable little munchkin. As you can see by my photo I am perfect. All 2 pounds of me! I sleep a lot but when I am up I am a speedy gonzales. My breed is what they call a MI-KI is pronounced Me-Key. 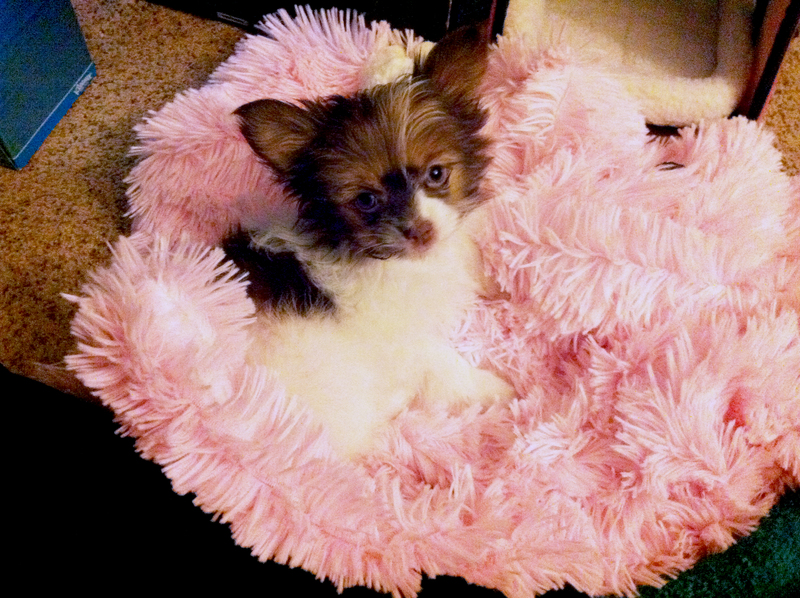 They say I am a toy breed, a designer dog with a mixture of Maltese, Papillon, and Japanese Chin. I will be reporting on my life here in Hollywood as well as any new adventure that I might have with my parents. I just got my last puppy shots so I have only been out to the dr.’s office and a few very guarded trips to MAXWELL DOG in studio city. I was very excited to go there as I read all about it from Lucy’s blogging and I must say that every last word that she wrote was true. That place is just the most barking place ever. My parents bout me this blankie there and boy oh boy is it soft. I love the girls at Maxwell Dog because they think I am just adorable.